Inspiration for the pieces I have written over the years for the PHS Newsletter often arrives via an odd cutting found amongst a collection of old papers that I purchased or found wedged between the pages of an ageing pub tome bought from one of the numerous (but sadly rapidly reducing) second-hand bookshops I visit on my travels every year. The twin Foxes on this sign at Stevenage, Hertfordshire, were, I was told, poachers with a remarkable alibi – no one could tell them apart. Apparently during the last century the twins led almost identical lives. They even shared the same names – Ebenezer Albert Fox and Albert Ebenezer Fox. They regularly trespassed and Albert had 120 convictions, while Ebenezer’s was 80. The pub now stands near Monks Wood where the Fox twins committed most of their crimes. Infamous, at least in the Stevenage area, these devious twins were renowned for their prolific poaching activities which resulted in them committing over 200 detected crimes between them. The twins were born in 1857 in Symonds Green and were named after the Baptist Ebenezer Chapel on Albert Street, Stevenage where their father, Henry Fox, was a lay preacher. Henry farmed 10 acres of land while their mother, Charlotte Fox, was a straw-plait worker. Even though they had a respectable family background, the twins turned to a life of poaching. However, they never engaged in those activities together and were thus able to provide alibis for each other which baffled and confused the local police. Despite this, they were caught and convicted on numerous occasions and each spent some time in prison. Research undertaken in the 1960s by Eric R. Delderfield revealed that Ebenezer Albert was ‘taciturn and would spend hours in a public house drinking,’ whilst his brother Albert Ebenezer was ‘a good-natured humorist,’ a man whose frequent appearances in court meant ‘a field day for all concerned.’ Delderfield revealed that Albert Ebenezer had a set-piece which he related in court ‘with the air of a man making a public address,’ his repartee making everyone in the court laugh, including the magistrates. According to Wikipedia (and to be honest I dislike being over-reliant on that source), whilst serving one of their prison sentences, the Fox twins attracted the attention of Sir Edward Henry who used them, and many other sets of twins, in his research to prove that an individual could be identified by his or her fingerprints. Ironically, according to the Stevenage Borough Council website, ‘the Fox twins were among the first criminals to be convicted using fingerprints as evidence.’ If this was indeed the case then the twins were either stupid or one of these sources has the story wrong. Both twins ended their days in Chalkdell House, Hitchin, Herts; Ebenezer dying there on 2nd October 1926 aged 68 but not before having first gone out for one more look at the fields and covers where he had spent so much of his life. Albert died there on 20th May 1937, aged 79. Up to his death he was visited by local gentry, many of whom he called his friends even given that some of them had sent him to court on numerous occasions. 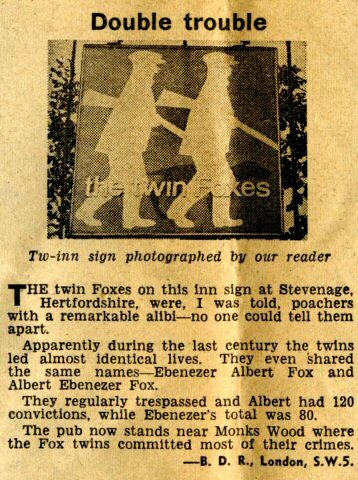 Over a quarter of a century later, their notoriety received due acknowledgement when, in 1953, Twin Foxes public house opened in the Bedwell area of Stevenage New Town (as it was then). Regrettably I was unable to find any details about the pub in my archive and the internet remains sadly bereft of references except that in 2008 it was a ‘music venue’ and that its address was 54 Rockingham Way. I do not even know which brewery it belonged to but guess that, as this was built on a New Town development, it had to be one of the major brewers. As for the Twin Foxes pub sign, the photograph in the Reveille cutting shows only one side of it. However, according to Dunkling and Wright, it was double-sided, the front featuring the twins silhouetted with guns under their arms with their dog in the background; the other side showing the heads of two foxes. In 1998, fifty-nine properties in Woolmer Green, near Knebworth (not far from Stevenage) were named after Albert and Ebenezer Fox; a bust of both men resting on top of pillars at the entrance to the estate. So there you have it; a pub named after a pair of ne’er-do-wells who seem to have endeared themselves to the public, the lawmakers, royalty, local gentry and New Town developers alike. As always I welcome feedback from any PHS member or visitor to this website. If you do have any information please write to me via the Contact page. Delderfield, Eric R. Introduction to Inn Signs (Newton Abbot: David & Charles, 1969), pp. 116-117. Dunkling, Leslie and Wright, Gordon. A Dictionary of Pub Signs (London: Routledge & Kegan Paul, 1987), page 275.